This type of welding power source usually consists a transformer and a bank of rectifying cells. A unit rectifying cell is called a diode and it allows the electrical current to pass only in one direction and thus helps in converting alternating current to direct current. The welding industry uses solid-state devices like semi-conductors to make rectifying cells. Earlier selenium was mainly used to make these cells but because of the demand for higher economy, reliability, and efficiency most rectifying cells are now made of silicon. In comparison with motor-generator welding set, a rectifier welding power source has the following advantages. Smaller weight, size and cost. 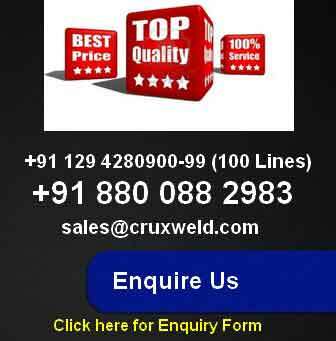 Due to easy control of heat balance as well as the ease of arc initiation and its maintenance, dc is used particularly for bare wire welding like mig welding machine. However, ac is more easily and commonly available. The best solution, therefore, appears to be to use ac to produce the required dc and that is done with the help of a dc generator, a convertor or a dc rectifier. Basically an electric rectifier is a device which permits flow of current on one direction only and can thus convert ac into a fluctuating dc. In the case of sinusoidal supply voltage suppression of the negative half of the curve results in intermittent pulses of energy which show no reversal in polarity. Obviously, such a source of supply would not be suitable for welding as periods of interrupted supply of energy between consecutive pulses would make it impossible to maintain a stable arc. This difficulty can, however, be overcome if the source of supply is a three-phase current, each phase displaced by 1200 with reference to preceding or succeeding phases. When the negative half cycles of all three phases are suppressed the resulting graph for the uni-directional current shows an approach to straight line with much smaller fluctuations than that in the case of single phase. On similar basis, systems with more than three phase ac would attain better closeness to true dc transient. However, it is common to come across systems with more than three phases, thus three phase system is the one most used. But there is another way of improving the shape of the rectified current, and that is referred to as full-wave rectification. DC rectifier, as mentioned earlier, is a device which permits current flow in one direction only, or more correctly it suppresses most of the current flow in reverse direction. Although the relation between voltage and current in the first quadrant of the graph is not linear, it can be noticed that for the third quadrant even a very large increase in voltage results in transmission of very small amount of current. As is evident from the different transients of rectified current, there is inherent fluctuation in such a system. One method of obtaining smooth dc from a rectifier unit is the use of capacitors. If a capacitor is connected in the circuit it stores energy and supplies the same at nearly constant output voltage, although the energy received by it from the rectifier is in variable pulses. Initially mercury arc rectifiers were developed but they are very fragile and have now been completely replaced by solid-state rectifiers.